Click the image below to view our Wedding Portfolio! 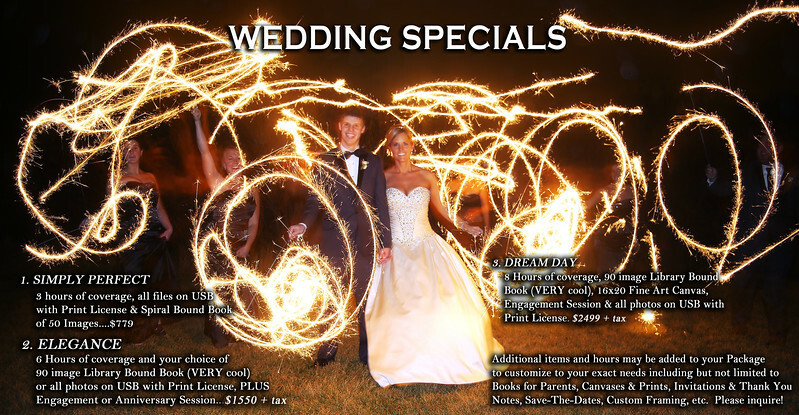 Scroll below the image for our Wedding Pricing details. 2. 10x10 Flush Mount Wedding Book Including 60-90 images. Dream Day--8 hours of Coverage, 10x10 Wedding Book with 60-90 images, 16x20 Fine Art Canvas, a Sweetheart Engagement Session and ALL FILES on USB drive (including Engagement Session) for $2450 (includes second shooter). *Custom-Designed Flush-Mount Wedding Book with 60-90 images, 10"x10" in size for $450. *All Files on USB Drive for $450. *16x20 Canvas Wall Portrait--$125 Sweetheart Engagement Session--$125 (includes a Book of your 30 favorite images) Additional Hour of coverage--$100 up to 8 total hours. After 8 hours of coverage, $200/hour. What We Do...My Wedding Photography coverage begins several months before your actual date. First, we need to meet and spend some time talking about your style, your goals for your photography, and your timeline. Oh, the timeline. I'm very happy to help you work out the schedule for your day--in fact, it will make everything go much more smoothly, reducing stress on everyone. I've been photographing weddings for 16 years, so I've seen quite a few, and I have a feel for what really makes a day flow well. This initial meeting is also a great time to do an Engagement Session so we can get to know each other, and of course so we can make some great casual images. As your Wedding Day approaches, we'll work together to get the timeline finalized and make any final touches to your coverage. No worries--weddings are fluid, and so are timelines. During your Day, I'll be right there to catch emotions as they happen. My husband Mike usually comes with me to Weddings, and it's really a joy for us to be a part of your day--we've been married for almost 20 years ourselves, so we have a great appreciation for what you are experiencing. We try to do several different types of photography for your coverage--a journalistic style to really document everything, some posed work for larger group shots, and of course lots of casual, fun work. Mike and I love to laugh, and we dislike being bored--we'll keep things moving, keep it light and casual, and try to make the photography enjoyable. Then, when it comes to portraits of the bride and groom alone, we work to make fine art portraits that really show who you are as a couple. Anything goes--we will be there to capture sunsets and smiles, indoor architecture and the wide open skies. After your day is over, we'll come back to our Studio and download your images, backing them up for extra security. Then the editing begins. Over the course of the next few weeks we'll perfect your images and offer you previews of your images on social media if you like. We most likely will blog about the fun we had making your images. Our Pricing...We offer Ala Carte Pricing as well as All-Inclusive Pricing for your Wedding Day coverage so YOU can decide exactly what you want. We are happy to custom-design a Photography Package for you that includes Parents Albums, Books for the Wedding Party, Slideshows, Hand-tinted portraits, or any other features you have in mind. After viewing the information below, please feel free to contact us to make an appointment to see our print portfolio including a variety of Wedding Books and Fine Art Canvases. We will be happy to answer any questions you might have, as well as to discuss your personal style and overall feel of the photography you are looking for. Your Wedding is an extremely personal event, and we want to reflect that in the work we do for you. Share your Pinterest boards with us, bring in images from magazines and let us know exactly what you're looking for. Our materials used in our Canvases, Books, and Portraits are all acid-free and archival for 100+ years, and we will provide you with the information to keep your printed images looking good for your lifetime so you may pass them down as family heirlooms to your children and the future generations beyond. FOR A LIMITED TIME....ALL WEDDINGS booked during 2017 will receive your choice of an Engagement Session OR a One Year Anniversary Session free of charge!